Buy one 5 litres or more of Liberon Decking Oil for free delivery on this entire order ! FREE NEXT WORKING DAY DELIVERY ON THIS ITEM ! ORDER THIS ITEM WITH ANY OTHER PRODUCTS AND WE'LL SEND THE WHOLE ORDER FREE OF CHARGE. 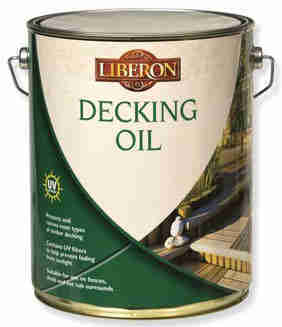 Liberon Decking Oil is ideal for feeding, protecting and enhancing the natural beauty of most types of timber decking. Liberon Decking Oil is perfect for reviving and restoring colour to old or new decking and is suitable for use on fences, garden sheds, gates and hot tubs etc. Containing UV filters it helps reduce discolouration and fading from the sun, whilst maintaining the finish. If your decking is very grey and has lost all its colour, Liberon Decking Oil in Teak or Medium Oak will put the colour back into the timber. Teak Decking Oil can be a little orange if used on new timber, in this case use the Clear or Medium Oak Decking Oil for full treatment and protection. Liberon Decking Oil is only available in the new sprayable version. This new formula can also be applied by brush. The colours are the same as the old version. For the price breakdowns see under the Pricing tab below. Liberon Decking Oil is available in Clear, Medium Oak or Teak shades. Ensure the surface is clean, dry and free from previous finishes and dust. Lightly sand new wood and clean old wood with Liberon Decking Cleaner. Stir well before use. 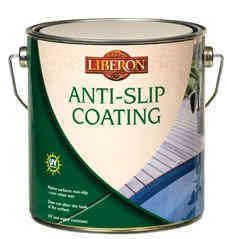 Apply a generous coat of Liberon Decking Oil with a paint brush or roller. Allow to penetrate for 15 to 30 minutes then apply the second coat without waiting for the first to dry. Continue to apply more coats of Decking Oil until the timber no longer absorbs the oil. Wipe any excess with a lint-free cotton cloth and allow to dry for 24 to 48 hours before using the decking. 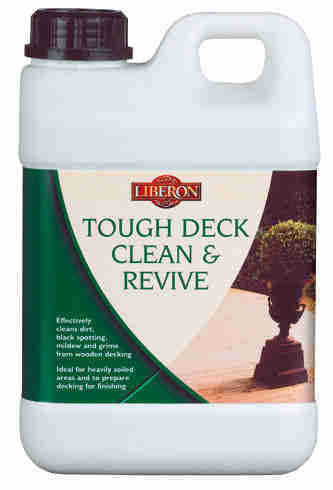 For general maintenance clean with Liberon Decking Cleaner. We recommend applying 1 or 2 coats of Liberon Decking Oil once a year as routine maintenance. On high traffic areas re-apply 1 or 2 coats of Decking Oil as and when required. Oil finishes bring out the natural colours of timber. A wet surface will be an approximate indication of the final colour, although the final colour may be darker depending on the timber . Always test product on a spare surface or inconspicuous area for colour, compatibility and end result. · Wear suitable clothing and protective gloves when using the Decking Oil. · Store Liberon Decking Oil at a temperature above 5°C. Always replace the lid otherwise the oil can deteriorate. · Oily cloths can self-combust. Do not leave impregnated cloths in bundles. Before discarding lay them flat outside to dry to avoid a fire hazard. · May not be suitable for some foreign hardwoods. Liberon Superior Danish Oil, Liberon Pure Tung Oil, and Liberon Boiled Linseed Oil.